I can hardly believe 2012 is nearly over. Where does the time go? I am always on the go and the days just seem to fly by. Here we are at the beginning of a new year already! Today I thought it would be nice to slow down, reminisce a little bit and take a look at what I have accomplished this year. Here are some highlights of my favorite projects completed in 2012. 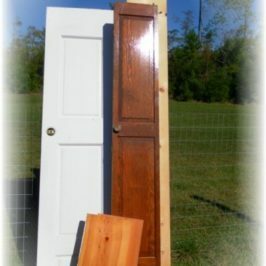 You may remember my January post Creating a New Pantry From Recycled Doors . I love my new pantry. It has added a lot of needed space in my kitchen and is chock full of character. I love working with old architectural salvage. 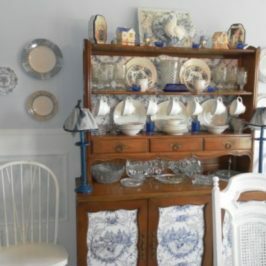 Back in February I shared with my blog land buddies the post A Kitchen Display Cabinet Makeover . This project was pretty simple and a lot of fun. I love being able to see my favorite polka dotted dishes every time I walk into the room! In March we toured a colorful beach home in Staging to Live…A Colorful Beach Condo . In July my sister got married and I had the pleasure of decorating for the event. My post Decorating For A Summer Wedding shows how you can make any wedding beautiful, even on a small budget. 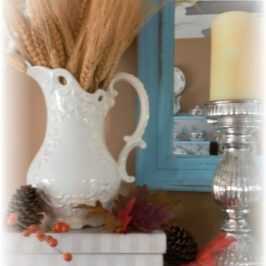 In September I unveiled my Shabby to Chic Master Bathroom Makeover . I think my favorite project of the year was the painstaking staircase makeover. 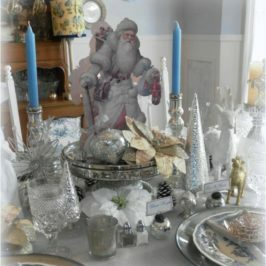 My post A Creative Staircase Makeover takes you through the entire process of turning this…..
And last but not least, my recent post How to Create Your Own Mercury Glass Charger Plates really tickled my fancy. I love how my plates turned out and will keep them on display year round. I’ve got oodles of projects on the agenda. All three bedrooms are in need of a makeover and the wheels are already turning in my mind. 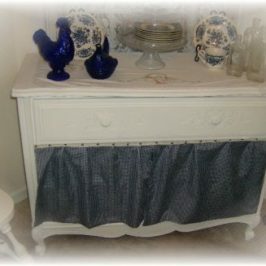 My master bedroom will be undergoing a complete transformation with new paint, furniture updates and new accessories. Some elements will stay, some will go. My children’s rooms need about the same amount of work done. Now I just have to figure out what room I am going to tackle first! I will also continue to work on, and move forward with my design business. Being in business for yourself is a constant learning experience. I hope 2013 will bring me closer to my goals and dreams as an entrepreneur. So, that’s my plan for 2013. Do you have any resolutions or dreams for the new year.? I hope 2013 will bring all of my readers good health, prosperity and happiness. What a great year of posts! 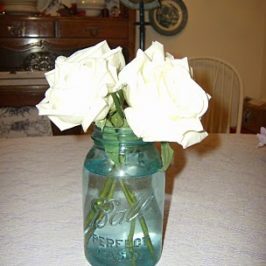 I'd love for you to link this up to my Best of 2012 Linky Party!